NMC 2014 Summer Conference: Not In My Wildest Dreams! The words “ambassadors” and “learning spaces” might not be at the forefront of your mind if you’re attending an educational-technology conference, but they certainly were for me while I was in Portland, Oregon for the New Media Consortium (NMC) 2014 Summer [ed-tech] Conference earlier this week. It was, in fact, at the intersection of ambassadors and learning spaces that I again saw what most attracts me to ed-tech and all other aspects of training-teaching-learning: the learners themselves. And what I saw needs to be seen by every one of us involved in and passionate about learning. The ambassador connection initially came within hours of my arrival onsite early in the week through my conference roommate, Jonathan Nalder—an Australian educator/ed-tech enthusiast who partially funded his trip to the conference by running an online fundraising campaign via Kickstarter. Nalder was among the more than 20 ed-tech aficionados worldwide chosen to serve in the first cohort of NMC ambassadors for their willingness to play the role of “knowledgeable members of NMC Horizon Project K-12 Advisory Boards in the discussions that lead to future K-12 editions of the NMC Horizon Report series, be the experts in their field in the NMC Commons, and gain recognition among an international body of colleagues as innovative educators,” as we are reminded on the NMC website. (The ambassadors earned their positions by submitting video applications that describe the innovations taking place at their schools and also give us a wonderful overview of what was happening in the world of K-12 ed-tech at the time those videos were submitted.) So it was an unexpected pleasure to join him and several other ambassadors for dinner—which is when the learning-spaces connections began. Hearing NMC Ambassador Lisa Gustinelli chat, during dinner, about a library that had become an “innovation center” she recently joined in a private high school in Florida teed up the topic nicely because it connected transformations I have been following: learning spaces that feature equipment and furniture that can easily be moved to accommodate the needs of learners and learning facilitators; collaborative environments; and the continuing evolution of libraries in ways that more overtly acknowledge and promote their long-standing role as learning centers. My own extremely rewarding onsite conference explorations of learning spaces continued during the week through a series of experiences including attendance at Houston Community College Northwest Director of Technology and Instructional Computing Tom Haymes’ session on idea spaces, and Al Biles’ engaging session providing an overview of innovations at the Rochester Institute of Technology Center for Media, Arts, Games, Interaction and Creativity (MAGIC)—which is beautifully described on the MAGIC website. The ambassador-and-learning-spaces connection came full circle early in the afternoon of the final day of the conference when I joined colleagues in exploring the conference “Idea Lab”—a stimulating ed-tech version of poster sessions designed to serve as “a dynamic place where creativity flows,” and where displays took various shapes including simple yet elegantly-designed stand-alone posters and informal presentations that incorporated content viewable on tablets. Walking over to the “Social Media: Connecting Young Learners to the World” session organized by NMC Ambassador Cheryl Steighner, I found what I hadn’t even known I was seeking: learners at the center of an Idea Lab session about the training-teaching-learning process. 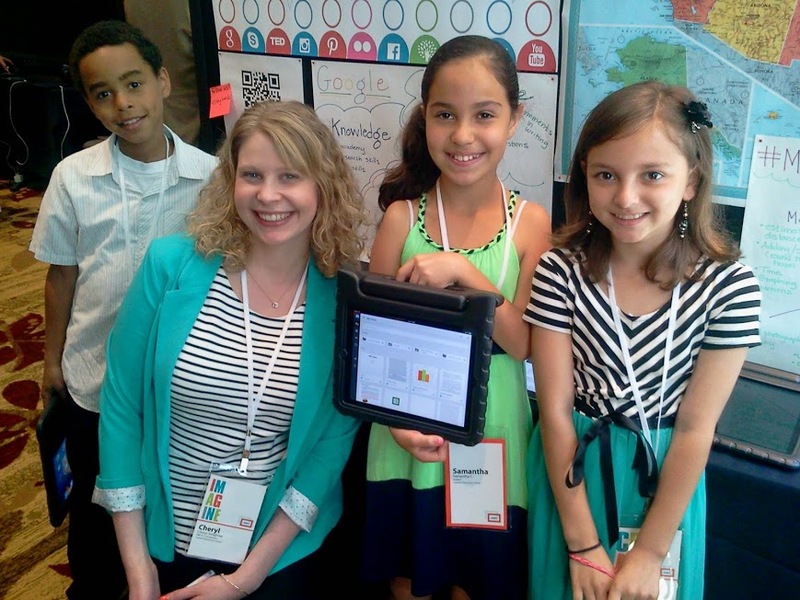 And not just any learners: Steighner’s co-presenters (lovingly referred to as her “Steighnerds”—were an amazing group of fourth- and fifth-grade students who were the youngest presenters ever to be included in an NMC Summer Conference, conference organizers confirmed. With Steighner standing nearby and intentionally taking a back seat to her learners, the students described how they had studied an interwoven variety of subjects by using Skype, Twitter, and other social media tools. 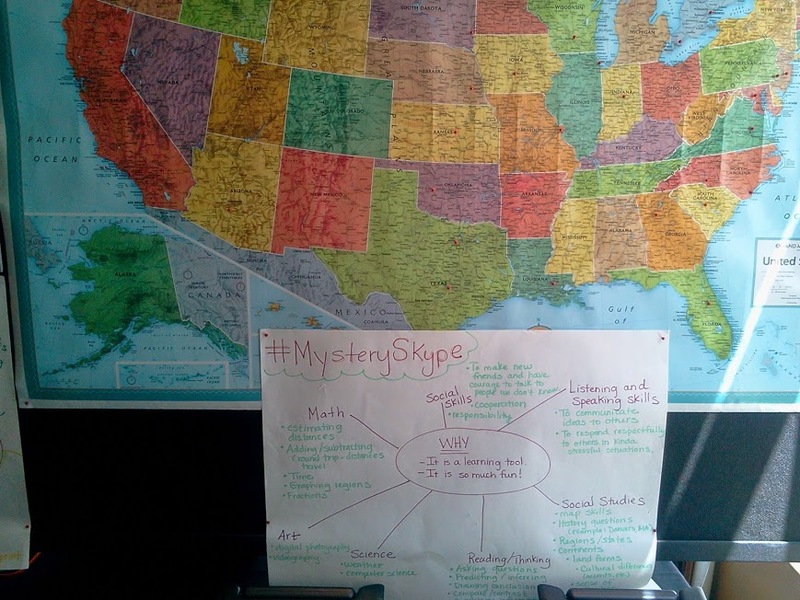 Via Skype, for example, they interviewed students from other parts of the United States; their initial challenge, shaped through gamification techniques and involving a series of yes-no questions, was to determine where their Skype colleagues were physically located. Once they determined the geographical setting inhabited by their fellow students, they located and marked those places on a map that is usually kept in their classroom and was brought onsite to the NMC conference to be incorporated into their Idea Lab display. But the learning didn’t stop at that elementary level during the Skype sessions; the students learned about their Skype-partners’ cities and states through conversations during those online sessions. The students also honed their English reading and writing skills by composing grammatically correct sentences that became tweets, and by using iPads to compose writing assignments on a variety of topics including the civil rights movement in America. Most striking about this blended learning/blended presentation approach is that it made me think far more broadly about the interwoven nature of our learning spaces than I ever had before. The Idea Lab space was a temporary learning space in which adults were learning about Steighner’s approach to teaching as well as about her learners’ sophisticated and enthusiastic approach to learning. The students’ learning space is an intriguingly blended onsite-online classroom that reaches as far as Steighner, Skype, Twitter, and NMC Summer Conference attendance will take them. The conference itself was a dynamically-inspiring learning space comprised of numerous elements: the smaller overlapping learning spaces ranging from the Idea Lab displays, workshops on massive open online courses (MOOCS) and other topics, and session break-out rooms to the larger ballroom settings where plenary sessions were held—and then beyond the hotel where the conference took place, extending into the restaurant where the ambassadors and I talked about innovation spaces and so much more Monday night, then extending even further into another restaurant the following evening with a slightly expanded group that included NMC staff, a workshop facilitator, and one of the conference plenary speakers. I clearly wasn’t the only one to notice the spectacular nature of what was occurring in this wonderfully expansive learning space. 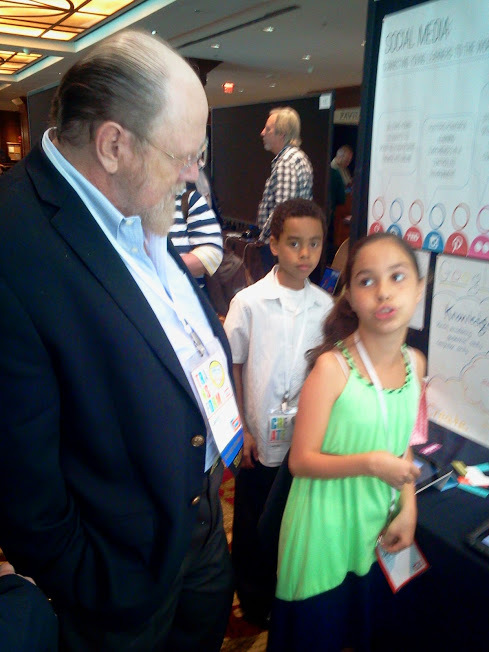 NMC CEO Larry Johnson, visiting with Steighner’s learners during the Idea Lab session, was clearly as moved by the experience as any of us were. After listening to the students describe what they have gained, he reached into his pocket and in what was clearly an unplanned act, handed each of them a business card and told them that when these fourth- and fifth-grade students were ready to enter the workforce, there would be a place waiting for them at the New Media Consortium. “When NMC started the Ambassador Program a year ago, did you have any idea that people like Cheryl would be producing results like this at an NMC conference?” I asked him a few minutes later. “Not in my wildest dreams,” he responded without hesitation. It simply has to be said: the ambassador project is one well worth observing and emulating, and those fourth- and fifth-grade learners who are becoming our partners merit all the attention we can give them, for they are going to be entering our workplaces sooner than we think. And the learning experiences and expectations they bring with them are going to offer us magnificent opportunities to continue growing with and responding to the evolving challenges of training-teaching-learning—or they are going to leave us in the dust. “They are going to change the world,” Steighner predicts in a way that cannot be denied, for they already are as we spend time with them. Learn from them. And are inspired to be even better than we are at what we do. This entry was posted on Friday, June 20th, 2014 at 5:53 pm and is filed under leadership, technology, training. You can follow any responses to this entry through the RSS 2.0 feed. You can leave a response, or trackback from your own site. One Response to NMC 2014 Summer Conference: Not In My Wildest Dreams! Hi Paul – has been a real pleasure to read your insights and point of view on the NMC conference!